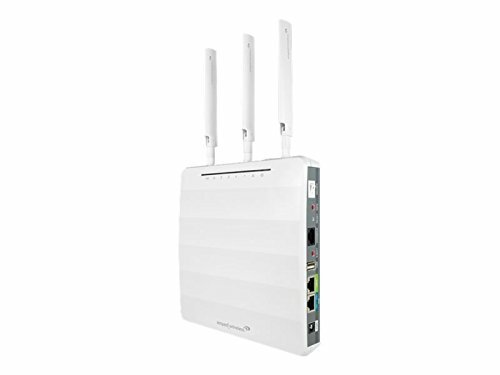 The ProSeries High power AC1750 access point/router is a multifaceted, long range, business-class Wi-Fi device with a unique set of 5 different modes. Router mode allows it to Act as a High power, long range Wi-Fi router. Access point mode is when the device is wired to any existing network to add long range, secure Wi-Fi access. In WDS-AP mode you can connect multiple access points together, wirelessly, to deliver wired and wireless Internet access across a large area. And for more intricate, larger networks – the APR175P can be placed in controller mode or managed mode. Controller mode allows for remote management of up to 7 access points, simultaneously, that are configured in managed mode. This mode allows for swift, simultaneous updates and control of a more broad and complex network. The ProSeries AC1750 access point is equipped with twelve High power amplifiers and three High gain, external antennas for up to 500mW of Wi-Fi output power. The combination of Amped wireless High power technology and blazing-fast AC1750 Wi-Fi delivers unmatched range and speed performance. It features the highest quality components and is tested under the strictest standards to ensure reliability and performance under demanding business environments.